Everyday this week I plan on writing a new healthy smoothie recipe to mix things up a bit. Truth is, I’ve never really been into the smoothie craze but I’ve been craving something different in the morning that tastes delicious and fills me up… Until about 12 pm. See my recipe below! Combine all of the ingredients in the blender until smooth. Why did I choose these ingredients? 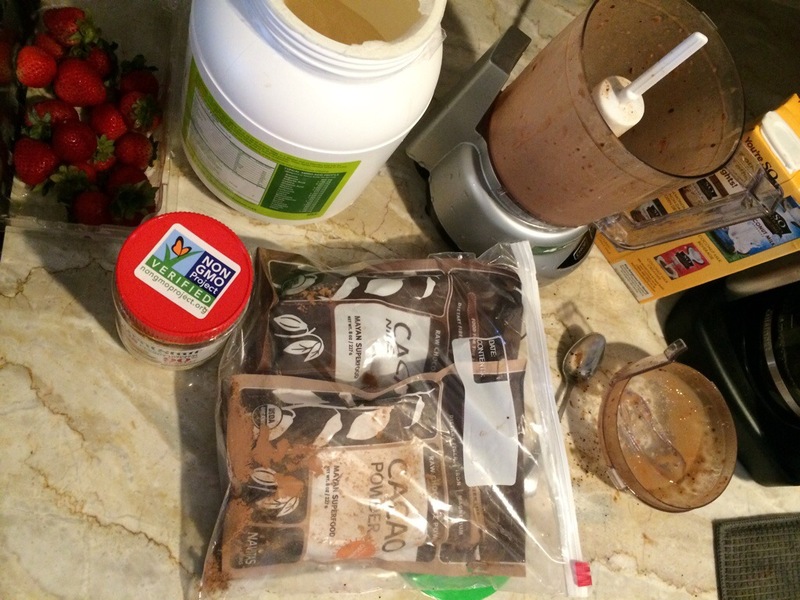 The cacao powder adds a powerful punch of antioxidants, energizing iron, and heart-healthy magnesium. The banana is a good source of vitamin B6, vitamin C, potassium, and dietary fiber. Strawberries contain vitamin K, magnesium, manganese, copper, omega-3 fatty acids, fiber, folate, vitamin B6, potassium and vitamins B2. Creamy almond milk contributes to the high protein content so you’ll stay full all morning long. The cacao nibs, my favorite ingredient, are nature’s chocolate chips. They are made from pure cacao beans that come straight out of the tropical cacao fruit. With the strawberries, it tastes like chocolate covered strawberries. Give it a try!